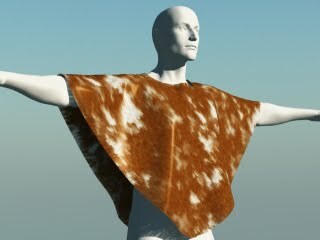 Well after much fiddling I’ve produced my first complete dynamic cloth garment for Poser. Originally shaped in Virtual Fashion I textured it in Deep Paint 3D and Paint Shop Pro before taking it into Poser where I ran a simple cloth simulation so it has a bit more of a drape to it. Finally rendered in Vue 6. Modelled after garments that appear in The 13th Warrior and other films of a similar period. According to one Wikipedia entry, along with various clones of that article on other sites, is called a Gurgel but I can’t find any other reference to it by that name but for now it will do. Its been a long time since I modelled and textured anything in this kind of process and it reminded me how greatful I am that there is so much good content at reasonable prices these days. Tomorrow I’m going to tackle the somewhat more complex texturing of the shirt and trousers to go with it. hahaha , very beautiful poncho! Looks like a poncho to me!